I rounded him out today and prepped his face so I can add his facial features. Here are a few pics of the little figure with the second coat of stain. He's still sucking in the stain in a some areas. I may put a third coat on him before I switch to the finishing oil. Here are a few pics I took as I was staining the little warrior figure today. I will put one more coat of stain on him and then start applying the oil finish. I need at least 4 more hours of sanding time and then I can get him in stain and oil. He's not perfect, but I am happy with him so far. The carving on this guy is mostly complete. Now I get to sand, stain, and finish him. Hopefully I can have him completed in another week or so. Greg Fairclough was born in Boston, Massachusetts, and raised in Connecticut. As a child he was an avid fisherman, woodcarver, and painter. His love of fish and romance with the sea drove him to earn a Bachelor's degree in Marine Biology and a Master's degree in Ocean Science. Greg has taught Marine Biology and Oceanography aboard research vessels and in the college classroom. He has worked as a Marine Biologist for the Florida Marine Research Institute, the National Marine Fisheries Service, and the Gulf States Marine Fisheries Commission. He currently works for NOAA Fisheries Service Highly Migratory Species Management Division drafting fishery management plans for sharks, tunas, swordfish, and billfish. Greg began to express himself through his art at an early age. By the time he was in grade school he was an accomplished wood carver and painter. In the 1980's and 1990's Greg sold all of his art locally. In 2000 Greg opened his own web-based art business, Sah-may San Gyotaku (www.sahmaysan.com), where he currently markets his art world-wide. 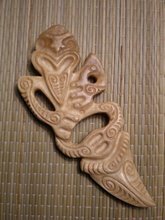 Greg's current interests include Primitive Anthropomorphic Sculpture, Polynesian Art, and Japanese Gyotaku.